This 2-day workshop will cover issues and knowledge about domestic Chinese medicinal herb production. Participants will learn about the cultivation of medicinal herbs, as well as addressing the relevant issues affecting herb quality and accessibility. This program will be of interest to growers, practitioners, students, and all those interested in the changing market of contemporary Asian herbal medicine. Note that this program is about growing medicinal plants and does not cover clinical use of herbs. – explore the big picture of the current Chinese herbal medicine products industry, threats and constraints, and the potential for North American production to alleviate these concerns. – introduce a framework for choices in crop selection, how to manage production, and bringing the crop to market. By understanding what growers must do to produce a crop, practitioners will become better able to collaborate and support local production. – review how production, harvesting and processing directly affects the final product. Various resources will also be made available. – investigate the assessment of medicinal quality, and the relationship of herbal quality to the characteristics of the growing region. – empower participants with the ability to use the knowledge and materials gained in the course to move forward with medicinal plant production and to help form durable relationships between local practitioners and growers. 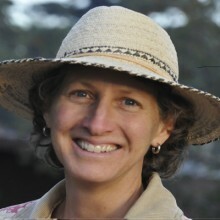 Peg Schafer has a background in nursery management and farming and is the owner/operator of the Chinese Medicinal Herb Farm outside Petaluma, in Northern California. In 2011 she authored the book The Chinese Medicinal Herb Farm: A Cultivator’s Guide to Small-Scale Organic Herb Production published by Chelsea Green. Peg’s focus in all endeavors is on growing the highest quality and most efficacious Chinese herbs possible. She is a frequent lecturer addressing herb quality, ecological cultivation practices, traditional Chinese herb production, conservation and other issues affecting Chinese herbs at schools of Oriental Medicine, conferences, and community events. The Chinese Medicinal Herb Farm was started almost 20 years ago while Peg was seeking a niche market to capitalize on her background in nursery management and farming. Nursery and field production followed selling to practitioners, medicine makers, product manufacturers, and pharmacies. Experimentation with various cultivation methods lead to specialization in certified organic, wild-simulated herb cultivation. To date more than 260 different Asian medicinals have been trialed from germination through harvest. The Chinese Medicinal Herb Farm maintains a collection of over 300 Asian medicinal plant species under cultivation, many of which are botanically authenticated. Mercy Yule is an East Asian Medicine Practitioner in Washington state, and co-founder of the NorthWest Asian Medicinal Herb Network. Mercy and 2 others speakers from the NWAMHN growers will augment Peg’s presentation with information specific to Northwest medicinal herb growing. *PRC diploma students will receive 1 CBOT/WHS academic credit for this workshop. A certificate of completion, which may be used to satisfy PDA requirements, will be provided to all participants. This course is NCCAOM PDA certified for 13.5 points. Participants should be very familiar with Peg Schafer’s book The Chinese Medicinal Herb Farm: A Cultivator’s Guide to Small-Scale Organic Herb Production published by Chelsea Green. This book is available to purchase at Pacific Rim College.